Finding and maintaining balance is a major theme of life—between work and leisure, time alone and time with others, eating healthy food and enjoying a treat. Software projects also involve a lot of balancing. One big facet (highlighted by conversations around Agile vs. Waterfall) is the balance between spending time to build precise plans in advance vs. starting to build real software as soon as possible and leaning on feedback to work toward the best result. If we find the right amount of detailed up-front planning and documentation, it will support a healthy Agile software project and increase our ability to collaborate effectively, deliver working software, and respond to change. The Agile Manifesto itself hints at this balance. Balance. Having enough process to promote the right interactions, and good enough tools to not get in the way. Having enough documentation to give the team a good chance at building the right software. Having enough of a contract to promote collaboration. Enough of a plan to provide a path to start down and some options to exercise when changes are needed. So what do these plans look like? UX Design Artifacts – personas, user stories, user interface sketches, etc. Now, let’s take a look at how to find the right balance, starting with some indications that a project may have too much or too little planning done ahead of development. When too little planning has been done ahead of time, a project can suffer from confusion and scrambling to keep work moving forward. Here are a few specific things to keep an eye out for. If you experience these on your project, it might be a good idea to invest more time working on those plans. 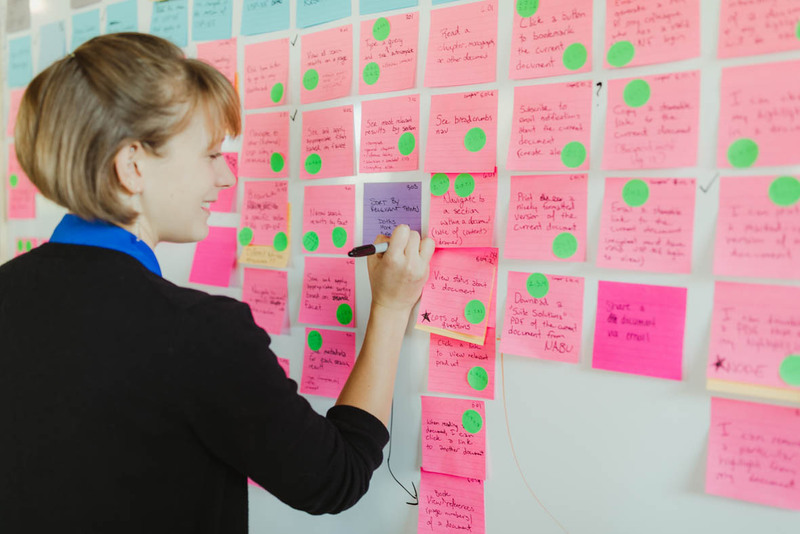 De-prioritizing even a few small stories causes a scramble to keep the team productive. Team members provide conflicting answers about what other features are on the horizon. Team members have a hard time connecting their work to the value it provides to users. Stakeholders are confused about when key features will be available. Small questions frequently cause big swings in plans. Delivered features miss the mark so badly that they don’t generate useful feedback. Balance results in plans that decrease in fidelity the further we look into the future. 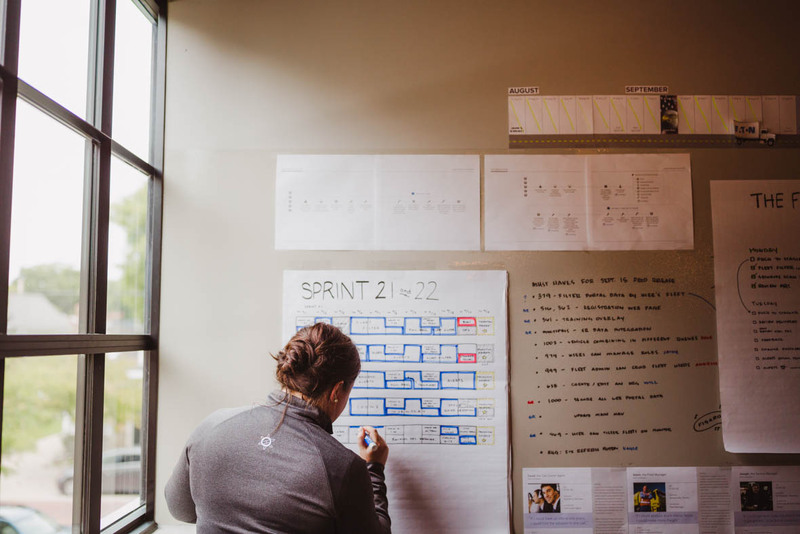 Near-term plans are high-fidelity: sprintable stories, detailed design comps, and prototypes. Further out, the fidelity decreases: key user stories mapped out, how data probably fits into the system, eventually slimming down to a rough roadmap of feature areas planned. Lower fidelity artifacts are typically easier to update when plans change and frequently isolated from some types of change (e.g., visual design changes). The primary metric that we use to evaluate the health of a project’s plans is having four to six weeks of sprintable work in the backlog. This gives us a good amount of flexibility (enough work to create parallel tracks of work and pull alternatives forward if needed) and provides enough sight lines to the future to plan and build in the right direction. How do you find and maintain the balance of detailed planning on your projects?